BattleBlock Theater has finally been given a solid release date of April 3rd and we’re all very excited to finally get our hands on this little nugget of joyous insanity. 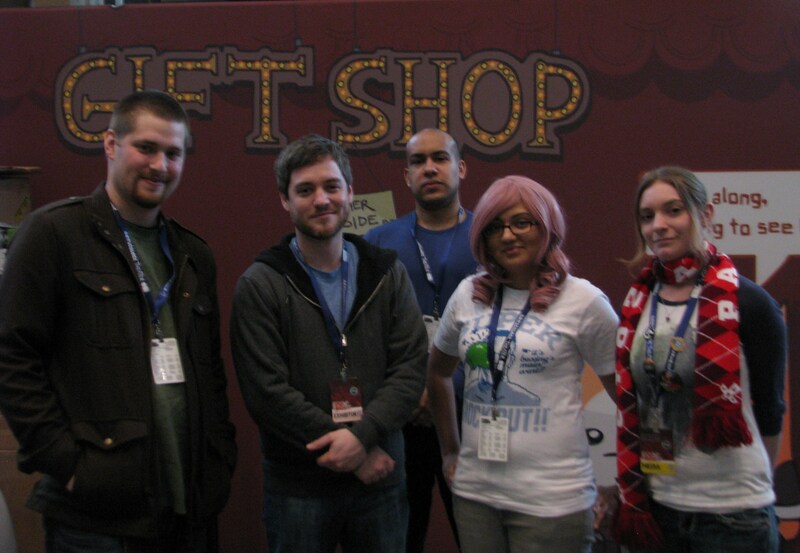 During PAX East this year the Royal Flush staff got the privilege to sit down with BattleBlock Theater Lead Level Designer Aaron Jungjohann to talk about what went into the creation of the game we’ve all been waiting for. So we’ve seen BattleBlock Theater at several PAX shows in previous years, can you walk us through what’s changed since the first showing? 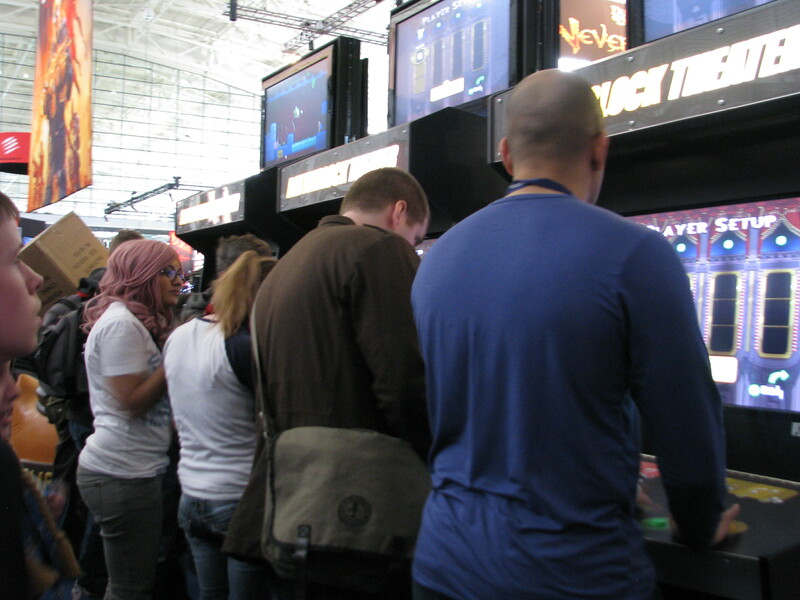 Aaron Jungjohann: Originally we were going to keep it to one screen [focusing on] smaller arena levels, more of a beat ‘em up with team versus team options. Any kind of linear point A to point B side scrolling/platforming/puzzling was going to be kind of minimal; we had little things that you could maybe finish in 60 seconds and that was [the extent] of it. 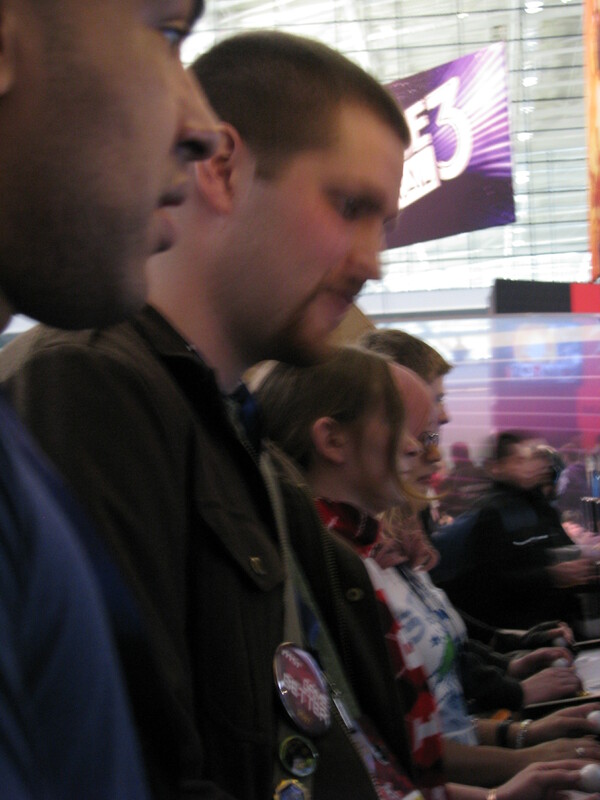 The way it’s developed since then is we were showing arena mode at all the different trade shows and people were like “ok it looks fun, the controls are tight but what’s going on here; I have bunch of combat moves I don’t understand how it fits together.” We threw a bunch of arena modes at them and it just wasn’t clicking for people; they were having fun but it was mostly chaos. So the next year we ended up showing our story mode and that’s where things started coming together, we got Will Stamper from New Grounds to come in and do the narration for the cut scenes and people seem to really enjoy that. He set the tone for the story quite a bit and added a little order to the chaos. I came in and started really seeing the potential of all these little building blocks where we could end up having a [greater scope] for the game so I started designing puzzles and an overall arc to the levels. I was a really big advocate for having a separate single player campaign and co-op campaign which would basically be remixes of each other. So when you play by yourself the levels would be designed so you could just run and gun without worrying about sections you couldn’t do if you didn’t have a buddy with you right then. While in [the] cooperative mode you wouldn’t find yourself in a single player environment feeling held back by your buddy and instead actually working together. So I think that was the beginning of it turning into what we have now, it’s the first time we’ve ever shown both the arenas which we finally brought back [along with] the story mode at the same time and I think people are starting to get an idea of the actual breadth of the game. 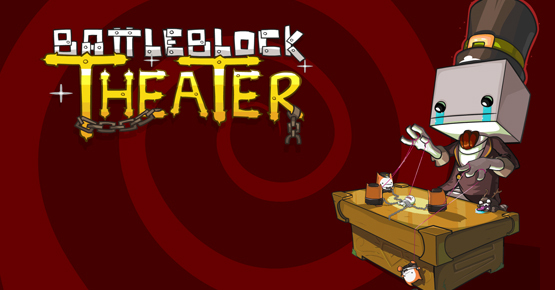 While you’ve always had that competitive/cooperative mechanic in past games it seems like you’ve really kicked it up to another level with BattleBlock Theater, what influenced that decision? Aaron Jungjohann: I think it really stood out in castle crashers, there was that wake up moment where you [realize], “whoa now I’m fighting everyone I was just working with” but it was really more of a highlight than anything else. I think with BattleBlock Theater the idea is now you can do that whenever so if you want to vent some frustration or just have a little “gotcha, ha-ha” moment that’s perfectly fine. In fact we added this golden hat that can randomly spawn in any of the levels and only the person who gets the golden hat can get the bonus gems that allow you to unlock your fellow prisoners and extra weapons and things like that. Normally everything in the game is shared, but all of a sudden the golden hat shows up and the friendliest players start beating each other up trying to get the hat to the exit themselves. Sometimes you’ll have players working together like a machine but then that hat shows up and they can’t trust each other anymore, it’s hilarious. With the extended development time the game has had what would you say is your favorite feature you guys have added in during that period? Aaron Jungjohann: I think the biggest one for me was this ball game mode had been put in and taken out a lot from the very beginning. It kept sounding really great on paper but the problem was the interaction between the player and the ball just wasn’t really working; it wasn’t smooth. We seriously considered dropping that mode and decided to put it on ice for a while. We came back to it a couple months later, tweaked it a little bit and now I think internally it’s our favorite arena mode. Of all the modes it’s the most clear when something decisive is happening, a lot of [the modes] it’s like ‘who can punch the other in the face the most’ and that can go back and forth really quickly so there’s not that much upheaval. But in the ball arena mode somebody’s about to shoot the last goal that’s going to win them the game and then someone else throws a Hail Mary grenade and intercepts the ball and its great. You also have these big, big changes that switch up the whole balance of the game depending on what weapons are brought and the arena itself has all this variety like playing basketball on conveyer belts with lasers on either end, it’s really awesome. There’s been a lot of stuff that’s been added and improved but has there been anything you’ve looked at and decided it isn’t going to work and removed from the game? Aaron Jungjohann: So one of the first things we had [Will] Stamper doing was having him do the intro to how players get to the island, we were trying to figure out how we were going to tell this story. So the first thing that came to mind is that it’s a theater, so we’ll have him doing plays. First thing we had Stamper do was little red riding hood and we just told him to do his thing and didn’t inform him of anything beyond that; it was completely psychotic and wonderful and he was narrating what was going on in the level as it played out. The problem was during internal play testing one of two things would happen: either players would focus on the game play and just lose what was happening in the story completely because they were so focused on not exploding or falling into a spike pit, or they would listen to the whole narration first and then begin to play the level. Cats seem to play an integral role in the story of BattleBlock Theater so I assume you guys hold cats in the same kind of reverence as the internet does. But if that’s true then why is it that The Behemoth logo is a chicken and not a cat, are you guys some kind of hypocrisy collective? Aaron Jungjohann: I think we identify with the majestic chicken; small in stature but full of utility and everybody loves what they can create one way or the other. But the thing with cats I think the idea was that in BattleBlock Theater we were going to have something watching you up on the stage and cats were a natural idea not only because Dan loves drawing them but because cats are so inscrutable and so alien in their thought process. So how terrifying would it be if you and say a hundred of your friends were going to be captured by anything, if it was cats what would they make you do? Would it make any sense? How could you possibly anticipate it? You don’t know what’s going to happen to you because who knows what they’re thought process is, so I think that’s it—you can’t anticipate what a cat does and you cannot, I promise, anticipate what’s going to happen in the story for the game. Can you give us a little insight as to why it’s taken so long to get the game out? Aaron Jungjohann: We thankfully have the luxury to be able to have those people in creative positions also helping to make the decisions of when are we happy with the game, when the potential we’re looking for [has been] achieved. The game actually took us as long as Castle Crashers did and I think people are surprised to hear that, and it has arguably more content than Castle Crashers. So I think a big part of it is people weren’t waiting with baited breath after Alien Hominid quite as much as they are now, the downloadable scene hadn’t blown up as much at that point. We shoot for transparency and I think it’s a noble goal but what ends up happening is we start talking about things the moment we start working on it. The game was still called ‘Game Three’ two and a half years ago which was about when Stamper and I came in and that was only halfway through development time. It’s an organic process and there are pros and cons. One of the cons is that things take a bit longer with a small team [that’s] just the way it goes. But the pros are that hopefully it meets the expectations for everybody as it’s meeting those that we have, and I think we set a pretty high standard for ourselves. We make the games that we want to play; we don’t just take a genre that was popular twenty-five years ago and say “remember this?” We build on those ideas and try to give it a modern level of polish and playability. All of us are very happy we took the extra time and we’re all very happy with the result. Probably the most fun and candid person I got to interview at the show, afterwards Aaron asked us if we’d like to take a crack at the ball arena mode of BattleBlock to which we replied with a resounding “hell yes!” We had originally slated the match to be guys versus girls with Chris and me facing off against Dani and Stephanie. However, through our collective (and expansive) knowledge of the BattleBlock character selection screen it somehow ended up being Stephanie and me versus Dani and Chris. Despite a good deal of confusion and punching my teammate in the face when she had the ball it was a blast to get our hands dirty with BattleBlock. Although Dani and Chris ended up winning out in the end due in no small part to my affinity for getting in my partners’ way it was a close one and a crazy fun game mode. Below are some highlight shots of our arena match, enjoy!